Note: Won his debut at Del Mar on July 3, followed by a second place finish in the Best Pal (G3) and a 6th in the Hopeful (G1). Came back to win his 2012 debut, the Robert B. Lewis (G2) at Santa Anita, then held off favorite Creative Cause by a nose to win the Santa Anita Derby (G1). Rallied from 7th early on to win the Kentucky Derby by 1 1/2 lengths over favorite Bodemeister, and then defeated Bodemeister again two weeks later, by a neck in the Preakness Stakes (G1). 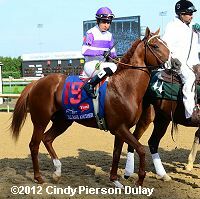 He will attempt to become the 12th Triple Crown winner in the Belmont Stakes (G1) on June 9.